DUMBARTON exited the Betfred Scottish League Cup by finishing bottom of group 'A', four points behind second bottom Forfar Athletic. "i'm glad the cup is over!" said manager Stevie Aitken after a tiny crowd of 340 watched his side overwhelm Peterhead at times but finish level at 3-3, then lose what seemed an endless penalty shootout 6-5. Jim McInally's side finished top of the group to qualify for the last sixteen, although Sons hit woodwork three times and had enough chances to win several matches. Sons hit back with a brace, first from Robert Thomson and then then a David Smith header (pictured), opening his account for Dumbarton. After the break Donald McCallum was fouled in the box, and Ryan Stevenson made it 3-1 from the penalty spot with Garry Fleming off injured. 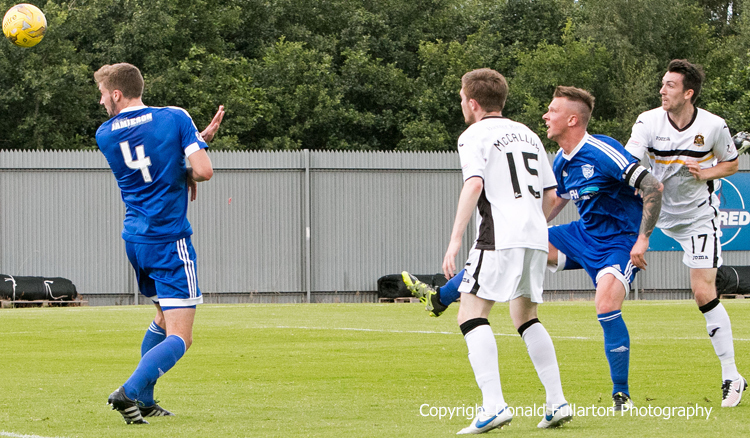 Leighton Macintosh and a Rory McAllister spot kick pulled goals back to level it for Peterhead, and with the score 3-3 at full time it was down to penalties to decide how the three points would be divided.